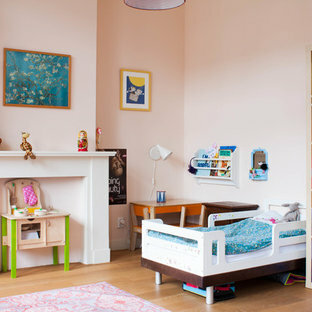 Large bohemian toddler’s room for girls in Amsterdam with pink walls and medium hardwood flooring. Bohemian teen’s room for girls in New York with grey walls, carpet and multi-coloured floors. Kids library and craft room. Design ideas for a medium sized bohemian gender neutral toddler’s room in New York with blue walls and carpet. 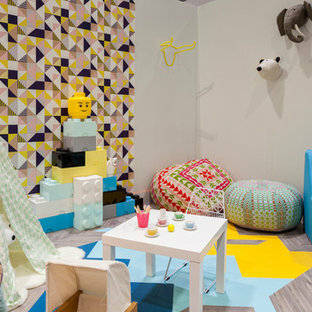 Inspiration for an eclectic gender neutral kids' room in London with medium hardwood flooring and multi-coloured floors. This is an example of an eclectic toddler’s room for boys in San Francisco with multi-coloured walls. Photo of a small eclectic children’s room for girls in Vancouver with blue walls. Bohemian toddler’s room for boys in Sydney with white walls and carpet. This is an example of a bohemian gender neutral kids' room in Seattle with grey walls, dark hardwood flooring and brown floors. Design ideas for an eclectic gender neutral children’s room in New York with blue walls and green floors. This is an example of a bohemian gender neutral kids' room in Detroit with white walls and carpet. 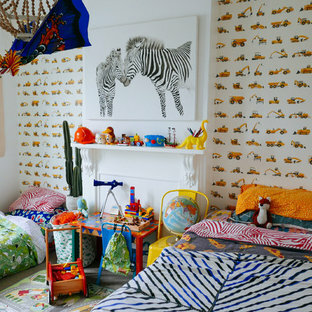 Photo of a bohemian gender neutral kids' room in Seattle with light hardwood flooring. THEME This room is dedicated to supporting and encouraging the young artist in art and music. From the hand-painted instruments decorating the music corner to the dedicated foldaway art table, every space is tailored to the creative spirit, offering a place to be inspired, a nook to relax or a corner to practice. This environment radiates energy from the ground up, showering the room in natural, vibrant color. FOCUS A majestic, floor-to-ceiling tree anchors the space, boldly transporting the beauty of nature into the house--along with the fun of swinging from a tree branch, pitching a tent or reading under the beautiful canopy. The tree shares pride of place with a unique, retroinspired room divider housing a colorful padded nook perfect for reading, watching television or just relaxing. STORAGE Multiple storage options are integrated to accommodate the family’s eclectic interests and varied needs. From hidden cabinets in the floor to movable shelves and storage bins, there is room for everything. The two wardrobes provide generous storage capacity without taking up valuable floor space, and readily open up to sweep toys out of sight. The myWall® panels accommodate various shelving options and bins that can all be repositioned as needed. Additional storage and display options are strategically provided around the room to store sheet music or display art projects on any of three magnetic panels. GROWTH While the young artist experiments with media or music, he can also adapt this space to complement his experiences. The myWall® panels promote easy transformation and expansion, offer unlimited options, and keep shelving at an optimum height as he grows. All the furniture rolls on casters so the room can sustain the action during a play date or be completely re-imagined if the family wants a makeover. SAFETY The elements in this large open space are all designed to enfold a young boy in a playful, creative and safe place. The modular components on the myWall® panels are all locked securely in place no matter what they store. The custom drop-down table includes two safety latches to prevent unintentional opening. The floor drop doors are all equipped with slow glide closing hinges so no fingers will be trapped. Bohemian teen’s room for girls in Los Angeles with multi-coloured walls and light hardwood flooring. Photo of a bohemian gender neutral nursery in Atlanta with yellow walls and dark hardwood flooring. The Most Incredible Kids' Tree House You'll Ever See? Inspiration for a medium sized bohemian family bathroom in Atlanta with white cabinets, flat-panel cabinets, an alcove bath, a shower/bath combination, a two-piece toilet, grey tiles, multi-coloured tiles, white tiles, porcelain tiles, multi-coloured walls, a submerged sink, solid surface worktops and mosaic tile flooring. This is an example of a medium sized bohemian children’s room for boys in Salt Lake City with multi-coloured walls, carpet and grey floors. Photo of a large bohemian kids' room in Chicago with multi-coloured walls.